The first few months of 2014 were focused on many of our San Felipe residents lending their time and efforts to help with various fundraisers for various non-profit organizations in San Felipe. We are so thankful for all the support that we receive from our local citizens of San Felipe. The 7th annual yard sale was a huge hit this year. We received a huge amount of donations and the variety of items was great. We also had a great response from our call for volunteers to help with sorting, organizing and helping out at the sale. A big thank you to John & Bonnie Gilbert from 99Plus One Ministries for once again loaning us their facility to hold our event. This was a record setting year. We made $5,000 U.S. for Sonshine Hacienda. Praise God!! Thank you to all you hard working volunteers. February 25th was the date for the annual Scorpion Fun Day adventure. This Jeep & Rescue Club holds this event annually and fun it is !! What a great group of people. We all gather together and have obstacle courses to challenge our driving skills. The one Gary and I enjoyed was "Blind Man Bluff". The driver is blind folded and has to follow the directions of the passenger…interesting. Well, at least I had fun!! After lunch we had a silent auction and raffle drawing. Proceeds from the Fun Day were donated to Sonshine Hacienda and totaled around $3,000.00. Thank you to our fellow Scorpions. The 8th annual Blues N Arts Festival, sponsored by the San Felipe Lions Club was held on March 28th & 29th. It was well attended and featured well known bands. Over the years The San Felipe Lions Club have been a vital partner with Sonshine Hacienda. They have been with us from the building phase of our project when Sonshine was just a dream until now. We thank them so much for all they do for our children. Every year, a portion of the proceeds from the annual Blues N Arts is donated to Sonshine Hacienda. We thank the San Felipe Lions Club once again for all their help and support. This is the second year that the Scorpion Club of San Felipe has invited our older children to a day trip out into the desert. The kids love it so much. They are each teamed up with a couple and their Jeep, along with a two way radio and a disposable camera to take their own pictures. Papa Gary and Mama Roberta (our Nanny for the boys) also went on the trip. The children got to explore the areas where they stopped. At lunch, they had a great time visiting with all the members and their various cute puppies, as pictured in the photo above. At the end of the day when the kids returned to Sonshine, they turned in their camera's. One of the club members got them all developed. The kids just got the pictures back a few weeks ago. They have some wonderful memories to cherish with those photos. Thank you for a wonderful day Scorpions. Gary Williams, Pastor at Woodward Park Baptist Church in Fresno, California, came with eight other members of their church to lend a hand at Sonshine Hacienda. The coordinators of this trip were Wayne and Paula Aranaz. 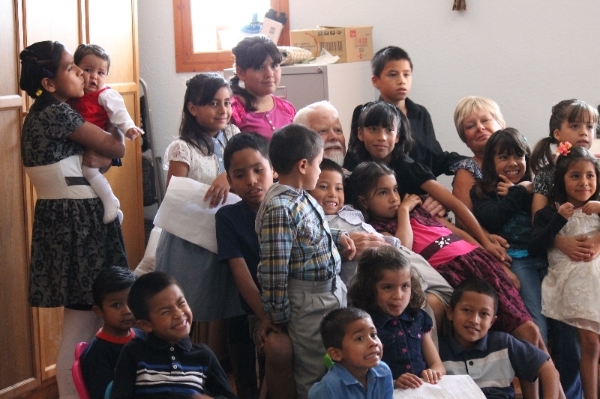 The women conducted a Children's Bible Club in a local neighborhood located close to our church, Mission San Felipe. They worked with our Mexican Pastor, Ildelfonso and his wife, Anita. The women also had fun with our children, doing face painting and other fun activities. The men worked on the grounds of Sonshine Hacienda. They painted and insulated a new storage shed. They also painted a used baby crib just in time to receive a new 8 month old baby girl. Great timing!! The team was a huge blessing to all of us. We hope that they will come back soon!! For the past few months Alexa (the tallest of the sisters), one of our first girls at Sonshine Hacienda(and our oldest child) has been quietly competing in an exciting academic competition sponsored by the Mexican school system. The first phase of the competition was a comprehensive exam given to all the pupils of her sixth grade class. She came out number one in her class. The second phase of the academic challenge required Alexa to take another exam at another school in San Felipe, competing with 19 other students (one student per school). Alexa scored one of the top seven, qualifying her to test at the next level in Mexicali. The seven students have taken the next exam in Mexicali and competed with hundreds of sixth grade students. We are awaiting the results of this exam. This competition will eventually lead to all of Baja, other parts of Mexico and eventually the winner will visit the White House in Mexico City. We are so proud of Alexa. She is a very special girl. She loves the Lord so much. She has spent at least half of her life in the "system". In spite of her tough beginnings, I see her transforming into a beautiful young lady. It does not matter if she goes any further in this competition. SHE IS ALREADY A WINNER!! The annual Spring Festival was held just a few days before spring break in April. Sonshine Hacienda has 5 students in our small Kindergarden class, so we are very involved in the entire process. All the parents are asked to help donate food to be sold at the event. The money raised helps to buy needed items for the class. We also helped provide some of the costumes that were used in the musical production. A great deal of kudos to our Kinder teacher for all her hard work. The dance numbers were so adorable. We had traditional Mexican numbers, a little duck dance, and a story that was acted out that told the story of the palace princesses that were kidnapped and the super heroes rescued them and returned them to their castle. GREAT STUFF!! The kids had a wonderful time. WE ARE SO THANKFUL FOR ALL THE WONDERFUL MEALS THAT HAROLD & CAROL STENSETH (PICTURED SOMEWHERE IN THE MIDDLE) PREPARED FOR OUR KIDS THESE PAST FEW MONTHS, ON THE COOKS DAY OFF. IT WAS SOOOO GOOD!!! Please pray for Joaquin, 5 years old. He recently had a reaction to a change in his psychiatric medication & has been referred to a Neurologist. Pray for God's leading in finding a new Nanny for our precious girls. Pray for our staff. They have long hours and little pay. We pray that they realize how valuable they are to us and our children.